Veteran artist Sue Zipkin is another member who connected with GANZ™ on the Art Licensing Show and made a dream come true with a sweet licensing deal for a gift line with this national company. Celebrate Life — is a fresh new collection filled with joy and bright colors. 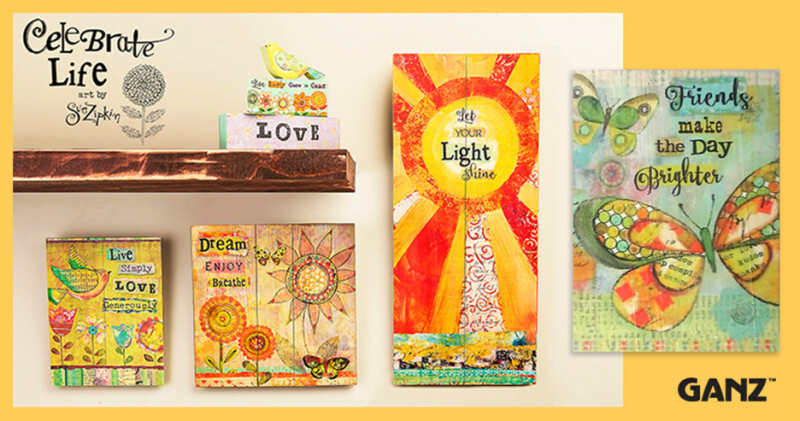 This mixed media line features uplifting and inspirational messages on wood gift items such as plaques, frames and magnets. You can also find Sue’s whimsical, painterly style and stunning watercolors on everything from dinnerware, fabric, home décor, gifts, stationary and greeting cards. After graduating from the School of Visual Arts, NY in ’83, Sue started working as an in–house designer for a well-known dinnerware company. Like a lot of artists, she had a dream to become an independent designer and license her art on a variety of products. As people often do — she was told that “most designers that go off on their own usually fail”. Well, don’t tell that to someone who is following their destiny to be a licensed artist. So she created a portfolio of artwork and followed her passion. Though Sue had a lot of art available in the mixed media style of art GANZ™ was developing, she worked with the product development team over many months on the collection. Her experience with product design helped in reworking her art for the products they were developing while she also tweaked colors and wording. The entire collection Celebrate Life™ launched in late Spring 2016 in gift stores across the country. Well, for us at The Art Licensing Show, we are more than happy to hear of serendipitous opportunities that lead to licensing deals for members. Was it fate for Sue and Lisa? Did the stars align to create opportunities for these two artists? Whatever made the magic happen for Sue and Lisa, it’s obvious to see that there is a lot of talent, hard work and unbridled passion on their parts for the art licensing industry. Congratulations to you both and we’re wishing you much more licensing success in the future! Sue Zipkin is an artist and designer with an impressive career in the art licensing industry for over the past 25 years. She works intuitively with her mixed media art and her watercolor flowers are sometimes painted from her own garden. Sue’s art can be seen on dinnerware, fabrics, home furnishings, giftware, paper products, greeting cards, and home decor products. Knowing that her artwork brings joy to people is a true gift that she’s grateful to be part of. To see more of Sue’s work, visit her website at www.suezipkin.com or request access to her complete portfolio on the Art Licensing Show.com. GANZ has been a leader in providing outstanding gifts worldwide for over 60 years. GANZ takes pride in offering some of the best gifts in the world ­ giftware, fashion accessories, top­ trending décor, baby fashion and huggable plush, garden, holiday and finishing touches for the home. GANZ created Webkinz® pets and Webkinz WorldTM, the first web­enabled toy and kids’ virtual world. GANZ is located in Toronto, Canada; GANZ U.S.A. LLC has offices in Atlanta, GA and Los Angeles, CA. You view their products online at www.ganz.com. This entry was posted in Art Licensing Show + Tell, Limelight Licensors on November 7, 2016 by Art Licensing Show . Thank you everyone, for your kind words! It was a great project to work on. Congratulations Sue. You have worked very hard and I’m so happy for you! What an exciting time for you! Congratulations on your efforts coming to fruition! Celebrating your “Celebrate Life” line! Congrats and thanks so much for sharing the good news! 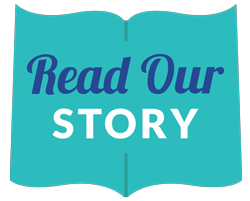 What a great story and collaboration! Congratulations! Beautiful ART and such a great, whimsical line for Ganz! Congrats! These are beautiful products! Congratulations Sue!